Physiology: Past, Present and Future documents the proceedings of a symposium in honor of Yngve Zotterman held in the Department of Physiology, Medical School, University of Bristol on 11-12 July 1979. The idea for the symposium was spurred by the knowledge that Yngve would reach the age of 80 in September 1978 and the belief that he would welcome a meeting to celebrate his great age and achievement, in the company of some of his distinguished friends and collaborators. The symposium discussed advances in several branches of physiology. These include studies on C-fiber afferents in the viscera, skin, and deeper somatic tissues; touch and pain; tactile paths in the nervous systems of mammals; jaw reflexes evoked from the cerebral cortex; thermoreception; and temperature sensitivity of humans and monkeys. Also included are papers on taste cell transduction; how the sense of taste controls appetitive and instrumental behavior; and structural changes in the excitable membrane during excitation. 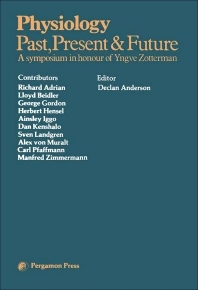 The book concludes with a discussion on future trends, which begins with some challenging remarks by Yngve Zotterman. These remarks are then taken up and developed by the speakers.